I really think these high yearbook prices are due to the schools not knowing what resources are available to them. With Shutterfly.com's new yearbooks, the price could be as low as $6 per book! 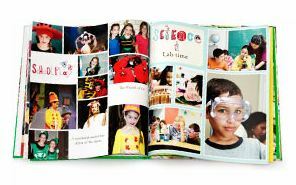 And just like Shutterfly's photo albums, they are easy to create and made to last. I personally love that once created, the book is saved and you can re-order at any time. Check out their page for more info on yearbooks for your child's school, clubs or organizations and request a quote. This is definitely something I would pass on to my children's school and my mom friends! Disclosure: This post is sponsored by Shutterfly. I am compensated for writing this post. All opinions contained in this post are completely and solely mine. I'm Tiffany. I started this blog in 2010, when my daughter was a few months old. Another kid later and I'm still living and learning how to do this mom thing, one day at a time.